The Student Registration Form can be found on The Test page! 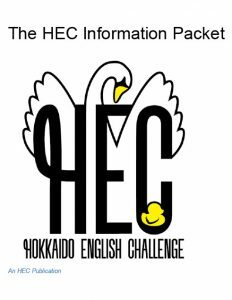 The HEC Guide has all of the information related to HEC. It’s more in depth than the HEC Information Packet! *The 2019 deadline for registration is February 4th, 2019. Otherwise, the information in the 2018 guide is relevant to the 2019 test. 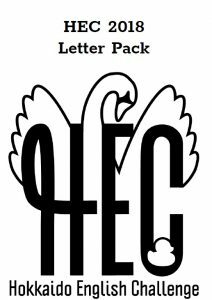 Help spread awareness of HEC! Here are some posters that you can print out and post at your school and around town! The posters contain all the useful information, including what HEC is, some important dates, and the prizes! The 2018 version was presented by Crystal Hartsough at the 2018 Skills Development Conference. The 2017 version was presented by Benjamin at the 2017 Sapporo ALT Development Conference. If you wish to review it, present it to others, or relive the experience, please go ahead!